Join Ludisis Mones, a Cuban dancer and certified Yoga Alliance teacher for this "7 Days Couples Eco-Yoga Retreat in Bali". Bring your partner to the yoga mat and breath! If you are a yoga lover, why do you hoard everything for yourself? Take your relationship to the mat and strengthen your relationship with each asana you make! Yoga as a couple is a great opportunity to experience the construction of trust, greater intimacy, and improved communication, all thanks to simple and powerful poses and techniques. Who knew that the child's pose (or any yoga pose) could be responsible for greater happiness and satisfaction in their relationship? Bring your partner to the yoga mat, and feel each inhalation and exhalation together. Be a force of connection and support both physically and emotionally. In our retreat it does not matter what level of yoga each one has. Even if both are beginners (or are in different stages if one of you has experience with yoga and the other does not), this yoga retreat for couples is the perfect platform to support each other from one pose to another, improving their communication, and sharing the experience, together. During the retreat, we will delve into the benefits of yoga. In our classes and workshops with each stretch, inhalation, and deep connection, we will connect with ourselves and we will witness the enjoyment of our better half. Each class is designed for the participation of both, each pose is done in conjunction with growing trust and confidence. Let's look at our partner's eyes as we meditate, focusing on the moment we are together, learning to let go and experience intimacy. Our yoga retreat will be at Bali Eco Stay, a small boutique resort with eight uniquely designed Balinese bungalows and pondoks, immersed in tropical food forest on the southern slopes of Mt Batukaru in the central Bali mountains, about 90 minutes drive from Ubud. We hope you will join us and enjoy with your partner our eco-yoga retreat. We have prepared it with love. Today will start a new beginning for you and your partner. After arriving at the Island of the Gods, our team will pick you up at the airport and take you to our ecological accommodation. This afternoon before a delicious dinner, we will hold a Balinese welcome ceremony. DAY 2: "Accepting and Loving each other"
This morning, when listening to the vibrant sound of the jungle, we will have a relaxing section of Hatha yoga for couples. Then, you can have breakfast full of exotic fruits and healthy infusions. There will be free time to be with your other half and lunch at the beautifully handcrafted Bali Eco Stay restaurant. This afternoon, we will have a section of dharma talks in which we will share experiences and deepen the healing value of yoga; not only for oneself, but also for the couple. You will have delicious vegetarian or vegan dinner. DAY 3: "Reconnecting with your inner child"
This is the "happy day", in which we will begin with a healing meditation as a couple. After a well-deserved breakfast, we will have a Thai massage workshop in which we will learn Thai massage techniques to relax and provide physical and mental well-being to our partner. You will have a healthy lunch, a session of Laughter yoga for couples, and later; dinner. This morning, we will begin with a section of mantra chants to Ganesha that will remove the obstacles. We will continue with a relaxing Hatha yoga class. After breakfast, you can optionally participate in a tour to Ubud: the cultural and touristic center of Bali. There will be lunch and time to relax with your partner. Then, you will have a sunset meditation and vegetarian or vegan food served from "the garden to the table". DAY 5: "Dancing is expressing your thoughts and feelings with your body. You will have pranayama session and meditation at dawn, and after that; breakfast. There will be time to connect with your beloved before lunch. This afternoon, let yourself be carried away by the music bar, as we will have a dance therapy class for couples in which you will learn how to relax the body parts through dance. Later, you will enjoy dinner. You will start the day with a Hatha yoga class for couples, followed by breakfast. There will be free time and then lunch. This afternoon, we will have a "Thai Reflexology Massage Workshop". There is nothing better than receiving a foot massage before going to bed. That's why Guenther Schauer will teach you basic techniques so that you can make this wonderful massage among you. DAY 7: "Love and Appreciation "
There will be a closing ceremony of the circle during the morning yoga session, followed by breakfast. Our team will take you to the airport if this is your last day in Bali. Optional beach trip and trip to Ubud. Eine Reservierung erfordert eine Anzahlung von 25% des Gesamtpreises. Der Restbetrag ist 60 Tage vor der Ankunft zu zahlen. 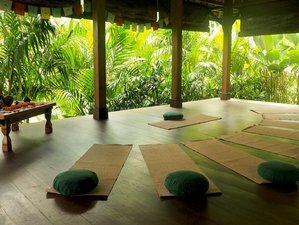 Yalorde Yoga ist ein Zentrum für Yoga, Thai-Massagen und Tanz, spezialisiert auf die Organisation, Vorbereitung und Durchführung von Yoga Retreats auf Kuba.